The magician introduces two black slates, blank on both sides. One side of the slate is signed by the spectator by white chalk. The slates are placed together, on the table. A card is then selected by the spectator from a deck, noted and returned to the deck. The deck is thoroughly shuffled and kept aside. The top slate is removed. The signature of the spectator is verified. Hey presto! 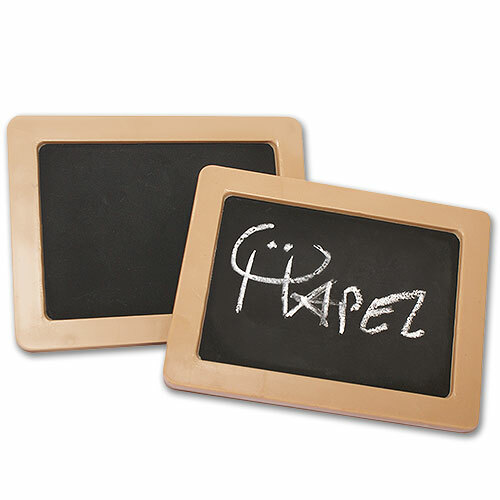 It is seen that the name of the selected card is written on the other side of the slate. - With a little imagination you will find many uses for the slates. - At the end of the routine the slates can be left for examination. - We supply the slates only. They measure cm 11 x 8,5 (4,3” x 3,3”) and are cm 0,8 (0,3”) thick.